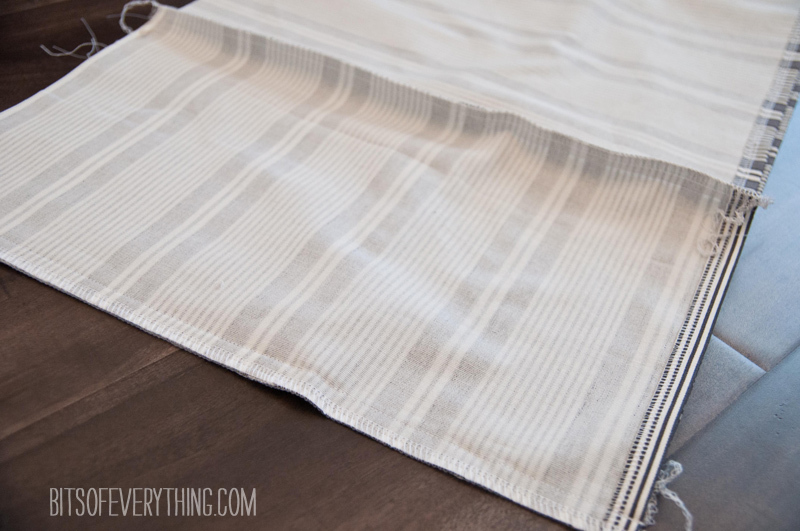 Summer is the perfect time to sew! 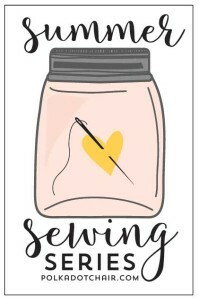 Sewing things for your kids and family or WITH your kids can always fun. I’m so excited to be included in the Summer Sewing Series with Polka Dot Chair. There are some great ideas this year! 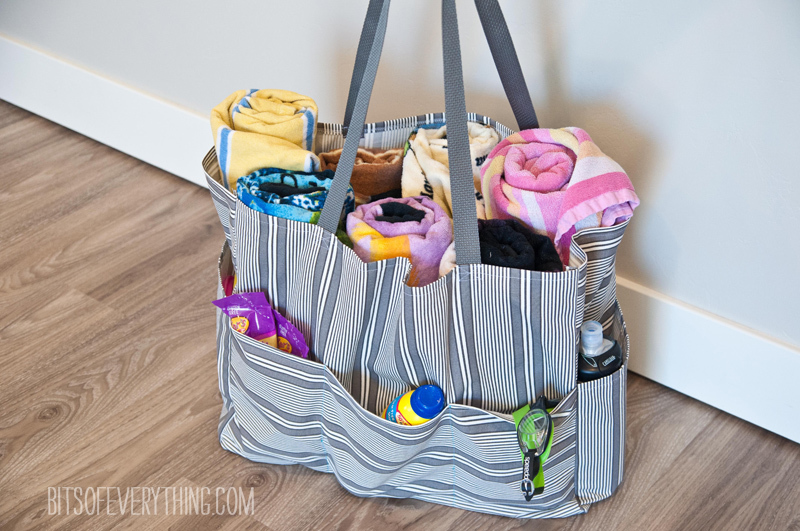 Today I’m showing how I made my new Pool Bag. I just got it made and I can’t wait to take it to the pool to try it out. Let’s get started! Here’s what you need. 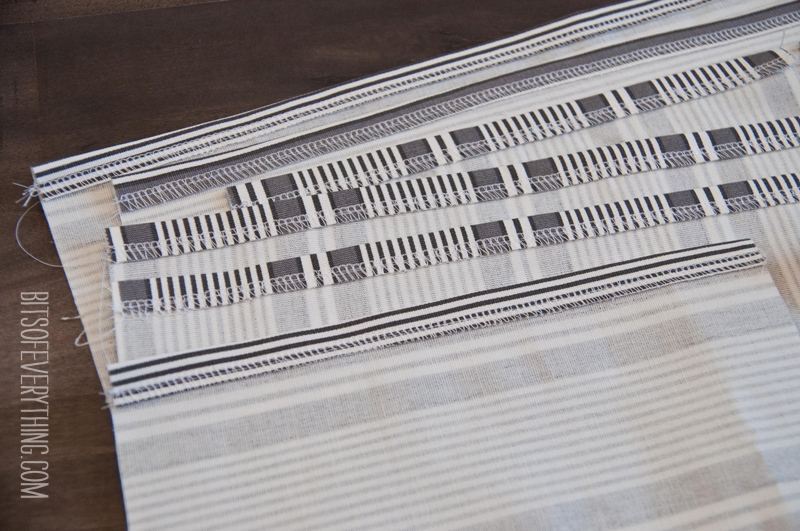 Fabric – 1 yard of thick fabric that is 60 inches wide. 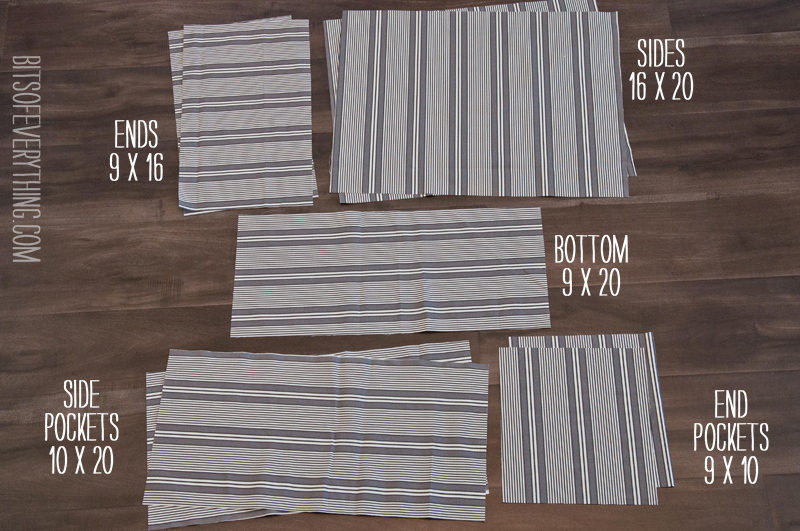 I bought this cute striped fabric at Ikea for under $8 a yard! Straps (optional) I used 60 inches (30 for each strap) but you can make them longer or shorter. 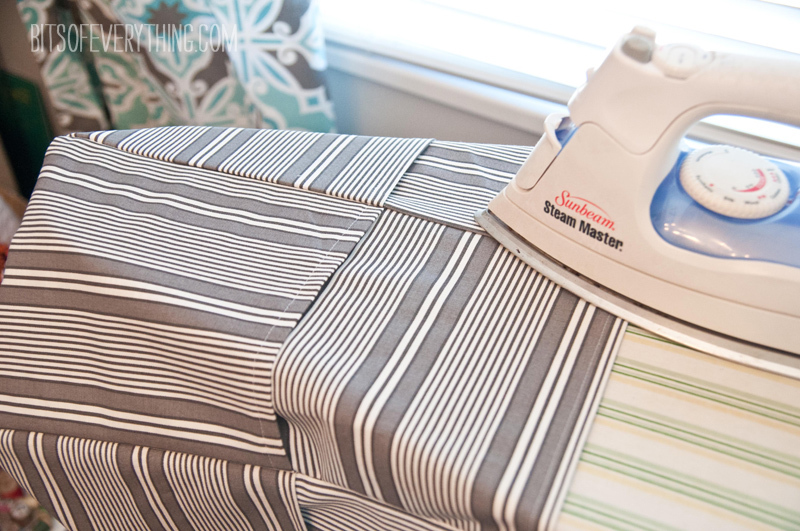 You could also use leftover fabric. 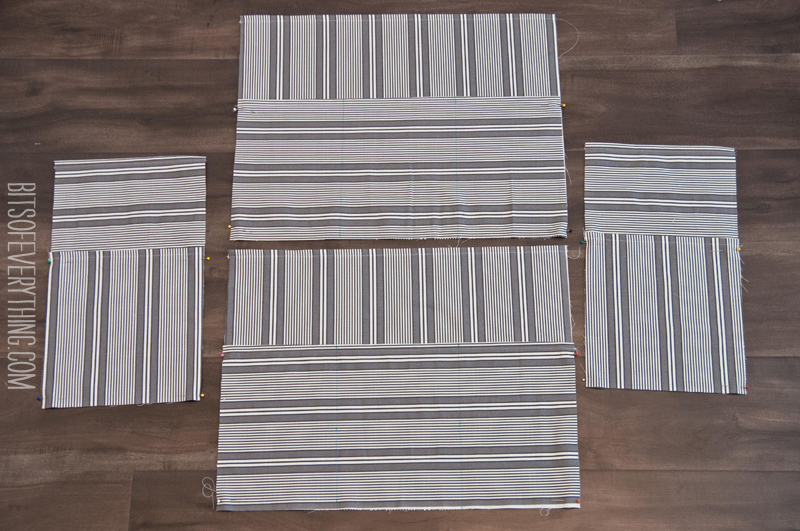 Cutting – Cut 2 sides, 2 ends, 1 bottom, 2 side pockets, and 2 end pockets. See measurements above. 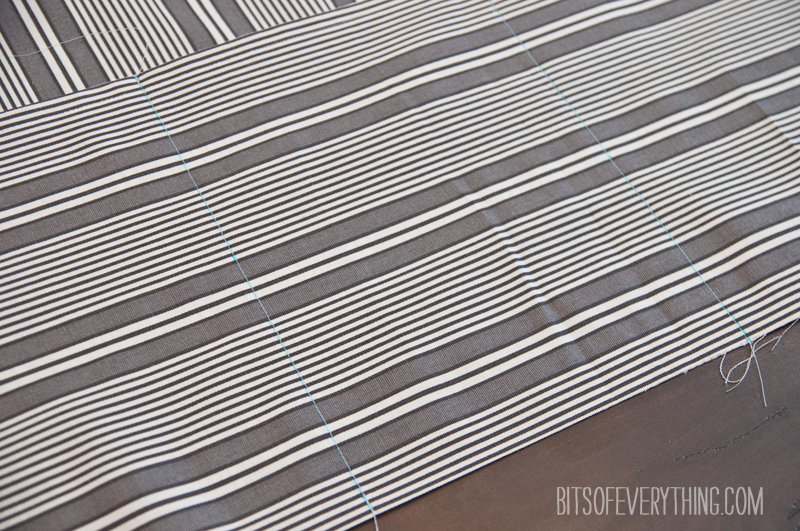 I have coordinated which way my stripes go, so pay attention to that if you are working with stripes. Pin your pocket pieces onto all the bag pieces (except the bottom piece). Mark and Sew where you want your pockets to be on the side pieces. I chose to have 3 pocket sections on my long sides of the bag. I marked my pocket lines 6.5 inches in from the edges. 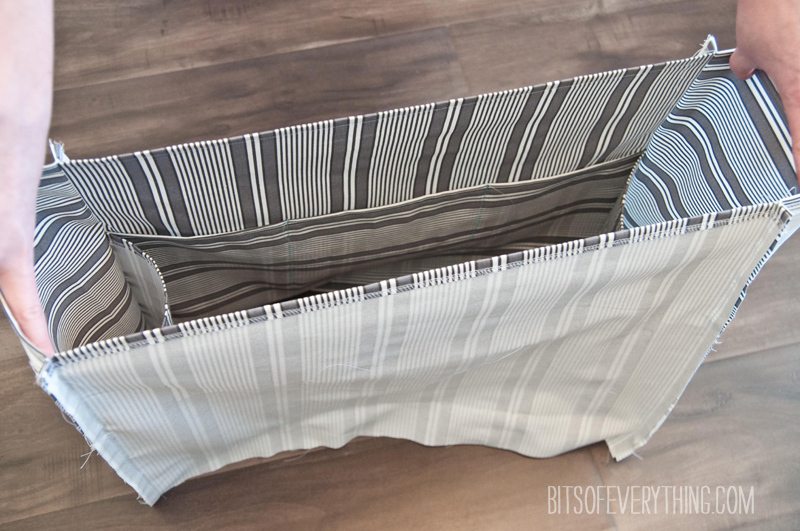 Sew your bag sections together with right sides together. Sew in this order: End, Side, End, Side, and then hook your first end piece to your last side piece. Your bag is coming together! This is how it should look now! 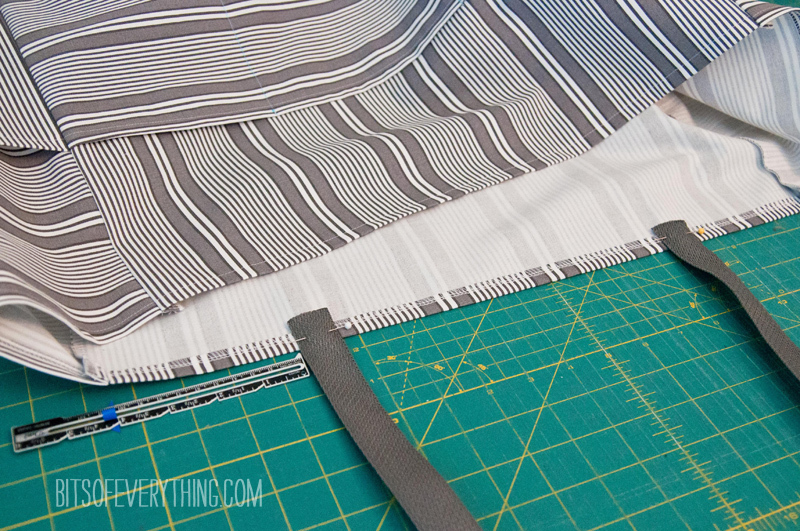 Serge or zigzag your inside seams to help prevent fraying. 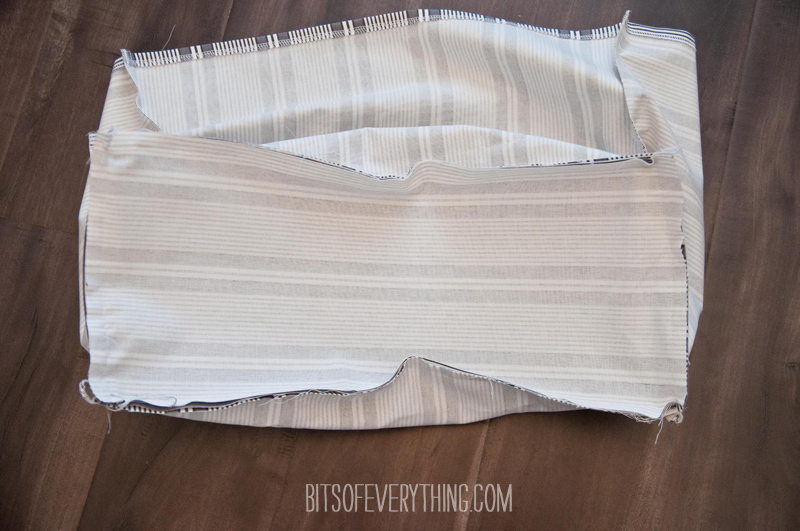 Pin and Sew your bottom piece into place. This is the trickiest part. I like to sink my needle and pivot each time I hit a corner seam. My seam along the bottom looks like a big rectangle. I also serged the edge of this bottom seam to finish it off. 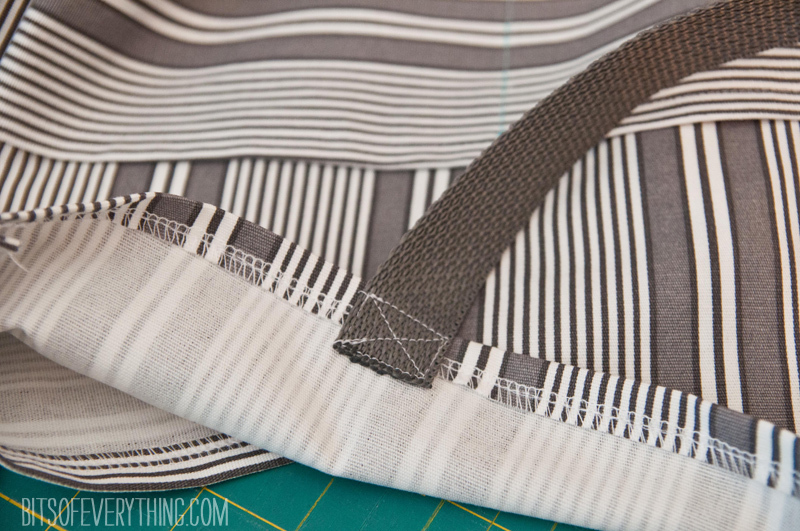 Turn and Press – Turn your bag right side out and press your corner seams to one side. You are almost done! Handles – Using the handle material, cut each handle to be 30 inches long (or your prefered length). Pin into place. I measure in 4 inches from the corner seam. Reinforce seam so that your handles are nice and strong! Load up your bag! I love all the pockets around the sides. I use them for water bottles, sunscreen, goggles, snacks, pool toys, my phone, and wallet. Nothing gets lost at the bottom of the bag anymore! I hope you love your bag as much as I do. Cute bag! Thank you for this very good and most inviting tutorial! I love my new bag!! I am a begginer and I found it very easy to follow. Very cute bag and well done tutorial. 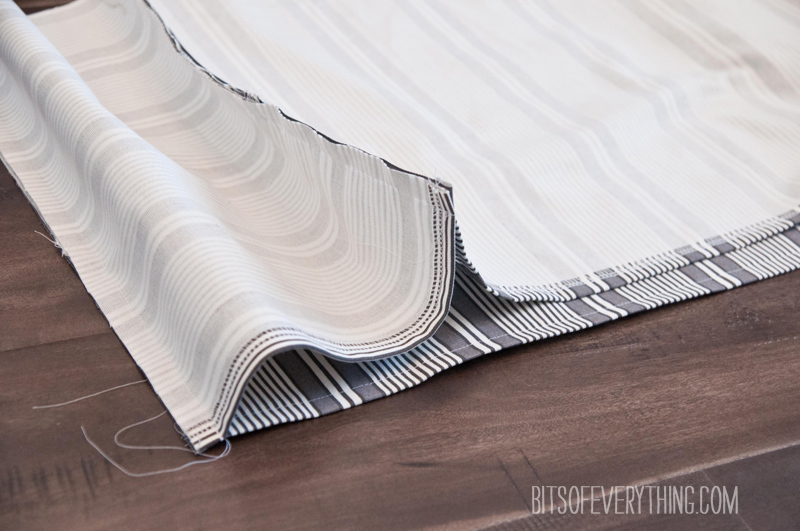 I only have 44″ wide fabric (quilting fabric) right now so would I need a yard and a half? I could make the pockets from scraps of a coordinating fabric. The possibilities are endless! Thank a lot! I did it with an inside pocket. Have a look on the comment of that post, if you want to it. Excellent tutorial. Turning this into a sewing bag. Hi. Thank you for doing this blog. Thank you!! Made a pool/beach bag for my most recent vacation and it was easy to follow and the bag was perfect. So much room for all the items my family needed. It fit all our water bottles and various sun blocks and a ridiculous amount of toys and snacks. So excited to make this bag! I’m going to make it as my sewing bag (as someone else said in the comments) and use coordinating frabric for the pockets (as someone else suggested. Your tutorial is amazing! Then I might make another one as anteachinng bag. 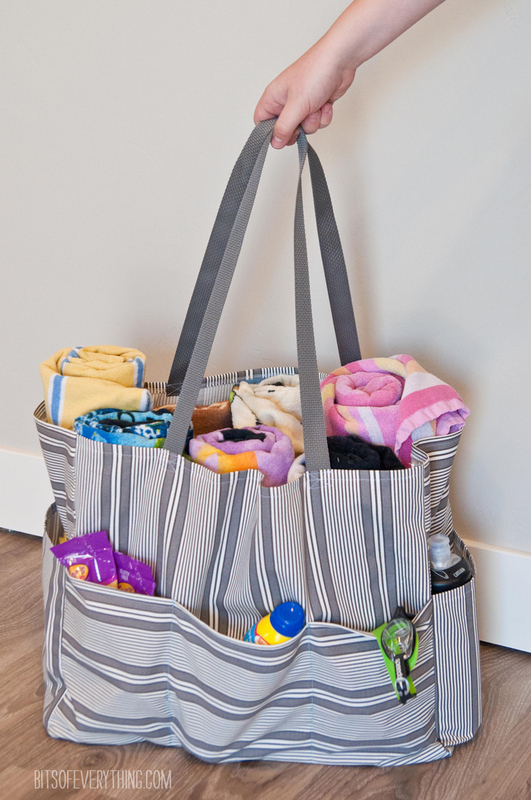 This bag looks so versatile with the multitude of pockets.